Islamic Terrorists have bombed Bodh Gaya, the sacred site where Buddha achieved enlightenment. 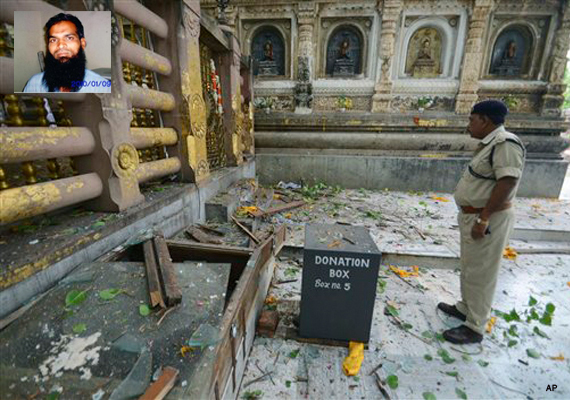 According to Gaya Police, the blasts took place in quick succession between 5.30am and 6am in the temple complex and near the Mahabodhi tree. One blast was reported from a bus stand. Zonal IG Sushil Khopade confirmed eight blasts. Bihar chief minister Nitish Kumar reached Bodh Gaya to take stock of the situation. He took a round of the Mahabodhi Temple complex and held a meeting with the officials. BJP activists led by former minister Prem Kumar greeted Nitish Kumar with 'go back' slogans outside the temple main gate. "A team of NIA officers is coming to Bodh Gaya from Kolkata," DIG special branch Parasnath said. The DIG said, "The sanctum sanctorum of the Mahabodhi Temple is intact. The temple premises have been sanitised." The secretary of the Bodh Gaya committee Dorji said, "There were four blasts inside the temple premises. Fortunately, there was no damage to the Bodhi Tree or the main temple structure." "In the first blast which took place near the Bodhi tree, a table was blown up because of which two persons were injured. The second blast, I think, was inside the enclosure where books were kept. The furniture was damaged but there was no damage to the monuments or statues," he said. He said, "We got information about six-seven months back that there may be a terror attack on the Mahabodhi temple. After that we had beefed up secuirty and deployed extra forces". "An Indian Mujahideen militant Syed Maqbool had told Delhi Police Special cell way back in October last year that they planned to target the Mahabodhi temple and other major Buddhist shrines. Syed Maqbool belongs to Maharashtra's Nanded district and is a close associate of underground IM leadr Yasin Bhatkal. Maqbool had told Delhi Police that Bhatkal had a plan to target Buddhist shrines in India to extract revenge for the killings of Rohingya Muslims in Myanmar. Delhi Police special cell had then given detailed info about the Bodh Gaya plan to Home Ministry, which in turn, had passed it on to Bihar police. A team from Gaya police had then visited Delhi and discussed about this info. The district magistrate of Gaya, who is the president of Bodh Gaya temple management committee, had then promised to instal cctv cameras at the shrine and in neighbouring localities. The Muslim terrorist group Indian Muhajiden must be disband . Time for Buddhist to tackle these terrorist group. The more people allow them to terrorize and dominate, the more death and destruction will come. It will not get any better. Why is it that governments have trouble getting rid of these terrorist organization? Don't worry, those terrorist is demon manifest ,Buddha will not angry with them but petty them they will be suffer in hell, they maybe hide in some where else but the god from heaven will find them and send them to hell. May Lord Buddha Bless all of you and attain Buddha hood .